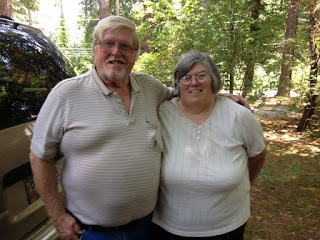 This is Nancy Jones Buice and her husband Phillip Buice. she has done a large amount of research on the Jones family or the Forsyth County, and the Alpharetta area. About 20 years ago we used to exchange genealogy information often. Her maiden name is Jones. She grew up with in a Jones neighborhood with uncles, aunts, grandparents, and cousins living all around her. My late mother-in-law Marie had many things she had picked up and held on to through the years. Two of the things were poster size pictures of Anna, Nancy, and Marie's Jones ancestors, William C. "Buck" Jones and Elizabeth Brown Jones. Both pictures have identical classic wood frames. We do not have wall space for the two pictures. I wanted to give them to somebody who would appreciate them, so I dug up Nancy's number and offered them to her. They came over to Marie's house a few weeks after I called and loved the pictures. Also while they were there I gave them other genealogical information about the Jones family; mostly newspaper clippings. I think getting those big framed pictures and the genealogical folders on the Jones made their day.